Sarah Nader- snader@shawmedia.com Kent Damore with the Chicago Chaos Arm-Wrestling Club arm wrestles with a team member during a training session at their training facility in Volo Monday, March 7, 2016. The team of 21 men and women recently received a team sponsorship by Harley Davidson. Sarah Nader- snader@shawmedia.com Joe Zelaya of Huntley arm wrestles a teammate during a training session at the Chicago Chaos Arm-Wrestling Club's training facility in Volo Monday, March 7, 2016. The team of 21 men and women recently received a team sponsorship by Harley Davidson. Sarah Nader- snader@shawmedia.com Kent Damore with the Chicago Chaos Arm-Wrestling Club demonstrates how he trains for arm wrestling competitions at his training facility in Volo Monday, March 7, 2016. Damore has been arm wrestling professionally for 29 years and his team of 21 men and women recently received a team sponsorship by Harley Davidson. Sarah Nader- snader@shawmedia.com Craig Wirth (left) of Lake Zurich watches as CJ Frank of Crystal Lake and Jose Zelaya of Huntley arm wrestle each other during a training session at the Chicago Chaos Arm-Wrestling Club's training facility in Volo Monday, March 7, 2016. The team of 21 men and women recently received a team sponsorship by Harley Davidson. 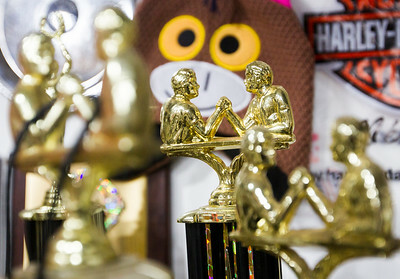 Sarah Nader- snader@shawmedia.com A view of arm wrestling trophies Kent Damore of McHenry has won. Sarah Nader- snader@shawmedia.com Jose Zelaya (left) of Huntley and Sam Nicholas of McHenry arm wrestle each other during a training session at the Chicago Chaos Arm-Wrestling Club's training facility in Volo Monday, March 7, 2016. The team of 21 men and women recently received a team sponsorship by Harley Davidson. Sarah Nader- snader@shawmedia.com CJ Frank of Crystal Lake arm wrestle a teammate during a training session at the Chicago Chaos Arm-Wrestling Club's training facility in Volo Monday, March 7, 2016. The team of 21 men and women recently received a team sponsorship by Harley Davidson. 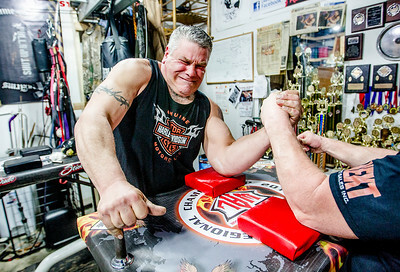 Kent Damore with the Chicago Chaos Arm-Wrestling Club demonstrates how he trains for arm wrestling competitions at his training facility in Volo Monday, March 7, 2016. 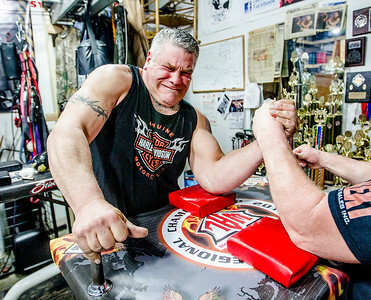 Damore has been arm wrestling professionally for 29 years and his team of 21 men and women recently received a team sponsorship by Harley Davidson.